Last weekend I received a copy of the beautiful new book by the ladies at Worm London. Katie Smyth and Terri Chandler are two florists who create stunning bouquets and flower displays for weddings, magazine shoots and private events. They also offer seasonal blooms for gifts, pairing them with vintage books. They simply ask for a few details about the recipient and then find the perfect book to match that person's interests - doesn't that sound like a wonderful present? I'd love that! 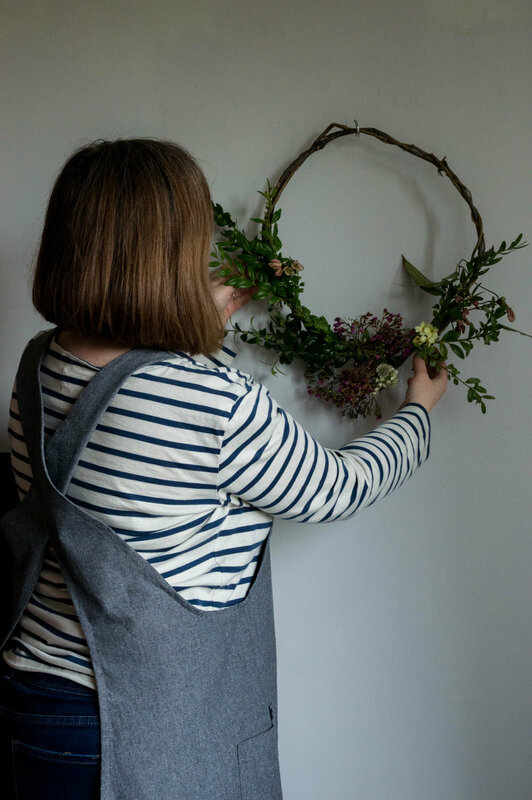 Sadly they only offer hand delivered bouquets and books in the London area but if you want to make your own Worm style posy then doing it yourself is easy when you follow the instructions in their first book 'Wreaths'. 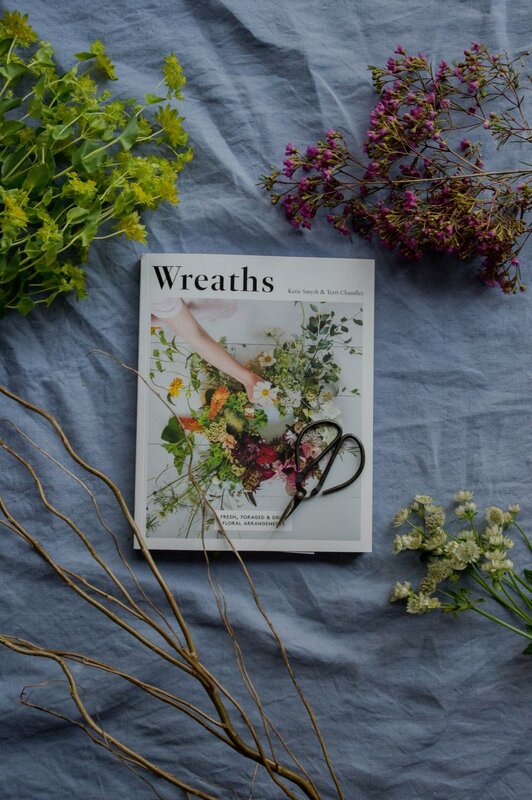 I've spent every day since I got my copy pouring over its pages as the photography is glorious, the styling and the design are beautiful and most important of all - it filled me with the desire to get creative with flowers. It's not all about wreaths though - there are ideas for wall hangings, floral chandeliers and a wall of dried flowers. It's a book that totally embraces the seasons, using what nature provides us with to bring into our homes. I do love a rustic inspired wreath - weaving the stems of vines from the garden and intertwining them with evergreens, herbs and flowers. I've made them before and they tend to look rather wild as I have really shaky hands and I'm extremely clumsy (only this morning I got the willow branches stuck in my hair, I spilled a glass of orange juice all over my slippers and I dropped my camera lens - you get the idea). Today I wanted to make something that would embrace Spring although sadly there isn't much going on in my own garden as it's been so cold and snowy. My clematis armandii (an evergreen variety) is starting to bud and open a few of it's delicate pink flowers and the hardy wild primroses (which I bought last year in a garden centre) are blooming happily away but I needed a little more than these to make a wreath. After a quick visit to my local flower shop I chose some pink wax flowers alongside a few white astrantia. I paired these with some evergreens and a few stems of willow to make the ring and I had what I needed to start my wreath. It's important to add that you do need a couple of essential floristry accessories to work with if you are going to get things to stay put - binding wire to strengthen the ring and attach heavier branches and some green florists tape which is used to discreetly bind the flowers on top of the evergreens. First of all I extracted the willow branches from my hair, then cut and trimmed the pieces as they had lots of offshoots and they needed to be single stems, then I bent the biggest one to form a rough circle. Twisting the stems at the end I used the binding wire to secure it into position. I used more willow stems and some old branches of clematis vine from the garden, weaving them around the original circle and again using the binding wire to make it more secure. Once I'd made the circle shape it was time to add the evergreens and flowers. I started cutting the foliage stems by following the instructions in the book and did the same with the flowers. Then I began to attach the greenery using the florist's tape. Honestly I struggled with this, probably down to lack of patience and frustration at it not working well for me at first as things kept falling off the ring. Rage set in for a while (haha!) but I was determined to crack it, so I kept battling on and eventually it all started to stay in place. Adding the flowers was the fun bit and also when I started to properly relax and enjoy myself. I opted for the wax flowers to be the centrepiece of my wreath and surrounded them with the astrantia heads along with the wild primroses and clematis buds I'd foraged from the garden. It's very rustic, but I love it and like all things in life, the more you do them, the better you get. Using fresh flowers obviously means that it won't look good for too long but both the wax flowers and the astrantia can be dried out to re-use later. 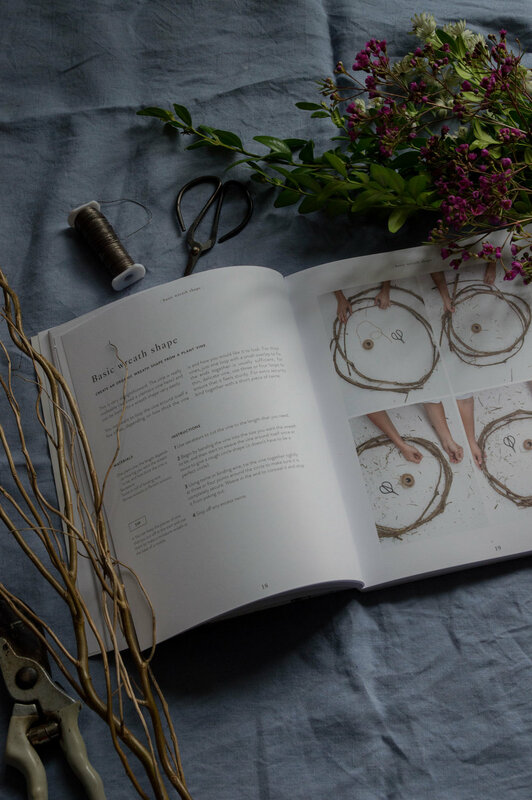 The book also has great ideas for using dried flowers and herbs and I'm particularly taken with the dried herb bunches all hanging on a string in the kitchen, offering a practical and stylish solution for culinary use. Once I get some more flowers in my own garden and the wildflowers are blooming in the woods, I'll go foraging and then I'll be trying to make another wreath. Follow Worm on Instagram here for lots of inspirational floral ideas.